Shade is the sixth album by alternative rock legends Living Colour, their first in eight years and of a piece with some of the band’s strongest-ever output. That it’s a spike-edged collection of in-your-face sounds is a given. This is Living Colour, which has been exploding genres since its mid-1980s debut and never met a blues-funk-metal tune it couldn’t deliver with soul and dazzling flights of improvisation. At the heart of Living Colour remains Vernon Reid, its founder and one of the finest and most consistently interesting guitarists of his or any generation: generously eclectic, loving on avant-garde sonics and rampant, rapid detours. Reid and his longtime Living Colour mates — singer Corey Glover, bassist Doug Wimbish and drummer Will Calhoun — are back on tour this fall, first in Europe and then in the U.S., the full range of dates JamBase is pleased to announce today. Living Colour begins the Shade In The U.S.A. Tour at the Havana Room in New Hope on October 12. From there, the group plays the Pennsylvania cities of Jim Thorpe and Pittsburgh ahead of stops in Massachusetts, Connecticut and Virginia. The tour continues with performances at Oddbody’s in Dayton on October 21 and at The Magic Bag near Detroit on October 23. 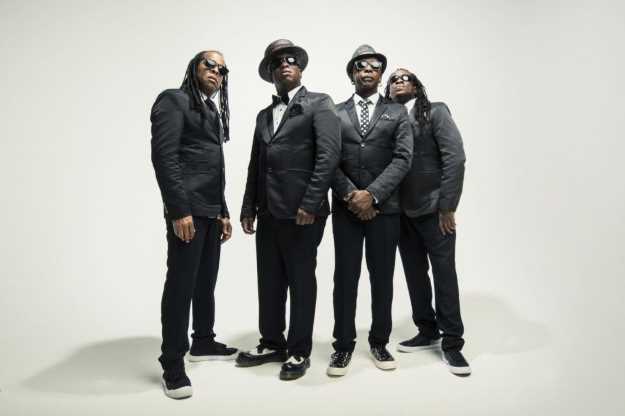 Living Colour then brings the run to Illinois and Tennessee. The Shade In The U.S.A. Tour concludes with a Southeast swing including concerts in Fort Lauderdale, St. Petersburg, Raleigh, Asheville, Atlanta, Orlando, Destin and a tour-ending stop at City Winery Nashville on November 9. See a full list of dates at the bottom of this post. Here’s Reid on Shade, on many connections to what Reid calls a blues narrative, and on the guitarist’s pleasures and pursuits inside and outside of Living Colour. JAMBASE: Talk about Shade — what do you want people to understand about this record and the current state of Living Colour? VERNON REID: This record really started out with the title. We were touring behind [2009’s] The Chair In the Doorway and I was having lunch with Corey and we were talking about what we were going to do next. We said, what about something called “shade.” We talk about “shade” from various aspects. Shade on the one hand is about relief, but it’s also something stressful. It’s also something related to skin tone. It’s also something about attitude. So we had a working title, and no idea what it was about, but some ideas for a framework. Later on, we got invited to play the centenary concert for Robert Johnson at the Apollo, and the song we were offered was “Preachin’ Blues.” We were kind of scattered at that time, and the thing was, we were not able to rehearse because everyone was traveling on other projects. So we’re at the Apollo and Taj Mahal and James “Blood” Ulmer and all these legendary people are there. I’m in the dressing room and listening to various versions of the tune, and also the original. Corey came in and I was pondering, well, do we try this, maybe we do this. And he just said, “Put those lyrics on that riff.” We basically went out there and hit it. It worked incredibly well and people were excited about the performance. That helped us tap into what the album is really about — reconnecting with the blues. That’s a different thing than making a blues record, which we did not do, but using blues as a narrative thread. Blues was a lens. JAMBASE: Is this different from the ways your records have come together in the past? VR: It’s shifted inasmuch as … well, I would say that this record is maybe the most conceptual we’ve done, in a sense of being thematic, since [1990’s] Time’s Up or [1993’s] Stain. Sometimes the themes emerge in the making of the thing. This is the first record we’ve done where I had an over-arching idea about a criteria, but you know, that criteria is very loose. These are blues narratives, and the three covers we do on the record, “Preachin’ Blues,” “Who Shot Ya?” and “Inner City Blues,” have one thing in common that their three protagonists were all shot to death. “Who Shot Ya?” is not a blues tune, per se, but it is part of the blues tradition and a blues narrative. We worked with a producer, Andre Betts, who’s primarily a hip-hop guy. This would have been way different if we had gone with someone with a blues background because It would have forced some questions about authenticity and turned this into a discussion about whether this is a blues album. I didn’t want that to be the thing. There’s a kind of tension, but there’s also a complete relatability in having a hip-hop producer on an album with blues as its central idea. Blues and hip-hop have a very close connection. They’re two of the only musics, for example, where artists use aliases for their songs. VR: They use noms de plume in both forms of music, so it’s a really interesting correlation and that’s just one interesting correlation. Most forms of music tell gritty stories — think about the urban blues of the great migration. So it’s thinking about blues, but in a way that freed us to be able to do what we wanted to do. JAMBASE: The older and well-known Living Colour material, which you’ve played thousands of time — do you still go looking for new things in these songs? Do you still get stuff out of them? VR: Yes. I come from an improvising background. I grew up listening to rock ’n’ roll but also to jazz, and forms of jazz that were developed in the later part of the 20th century, such as from Ornette Coleman. There are also modal ideas from people like Eric Dolphy and John Coltrane, and also crossover in people like Frank Zappa, who was a huge fan of Eric Dolphy. And then Jimi Hendrix, who was a pioneer of a kind of freeform — he was a real improviser. So even though I’ve played these tunes a lot, my framework is more from that improvising background. Hendrix never played anything the same way twice, and that ethos is connected to Coltrane’s thing. John McLaughlin, another improviser. Tommy Bolin was a great improviser. Those people and that ethos. A song like [Living Colour’s] “Middle Man” is essentially a C-minor blues. There are certain things I could start out doing in the solo, maybe begins as a recapitulation of the sung melody Corey is doing, but from that point on it’s an open framework. There’s a challenge in that, and I come at it and move toward and away from it depending on certain bags I might be in. Sometimes I make it, sometimes not. But I’m really interested in trying. JAMBASE: You’ve played and produced in so many different musical contexts, I’ve seen you with Living Colour, the Yohimbe Brothers, Masque and countless others. What bag haven’t you been in that you’d like to be? VR: Oh man, that’s an excellent question. I’d love to do some more stuff with DJ Logic, but you’re asking what’s a bag I haven’t been in that I’d like to be in. Well, you know, there’s a band I really like called Explosions In The Sky. What they do intrigues me. It’s very cinematic and I love their approach. And at some point … I have this thing I like to do occasionally called Verntronics, which is influenced a bit by Robert Fripp and Brian Eno. I’ve done it live and I’ve never done a recording of it. Among others, I sing occasionally and I mainly do background vocals. When Living Colour started, I was a singer but not as good enough of a singer for what the band needed to do. So I found an amazing singer, Corey, who’s even more amazing now. But I want to challenge myself to sing a bit. And I’d like to do an acoustic thing and I’m not sure what that is yet, but I think of almost like an acoustic arcana where I could alter the sounds. There’s this group The Books, and what they do is pretty much acoustic, but it sounds manipulated — they do incredible things. And then there’s all kinds of weird little songs things and full-on looping things very much influenced by Eno. Those are what come to mind. JAMBASE: You did mention Logic — will the Yohimbe Brothers do more? VR: Yeah man, we are. We made two records, and we had the title for the third record — the missing Yohimbe Bros record is called A Critique Of Pure Hype. I really want to do that record with Logic. I think we’re going to do it. It’ll be the two of us doing everything, but yeah, we actually did a duet performance in Harlem a few months back and it was really fun. It’s just carving out the time.